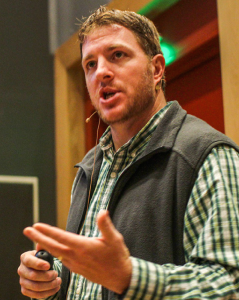 Dr. Jamie Farrell earned his Ph.D. in Geophysics from the University of Utah in 2014. He currently works as a seismologist at the University of Utah. Jamie’s research focuses on using seismology and geodesy to better understand the Yellowstone volcanic system. Recent research papers have included topics such as tomographic imaging of the Yellowstone magmatic system, in-depth analysis of Yellowstone seismicity and earthquake swarms, seismic and volcanic hazard and risk assessment of the Yellowstone region, seismic signals related to hydrothermal systems, and source characteristics of seismic events. Current research projects include continued analysis of Yellowstone seismicity, using ambient noise to better understand the velocity structure of the Yellowstone system, and continued analysis of earthquake swarm activity including its relationship to local uplift/subsidence signals. Farrell, J., R.B. Smith, W.-L. Chang, and C.M. Puskas (2017), The Mw4.8 Norris earthquake of 30 March, 2014 and its relationship to crustal deformation and seismic activity of the Yellowstone volcanic system, In Prep.